The Vision Jet is the realization of a vision to reimagine and reinvent the jet airplane in order to create a whole new category of aircraft -The Personal Jet. It's a jet that's designed to be flown by the owner. Not requiring a full-time professional pilot or a full-blown flight department, the Vision Jet fills the untapped void between high performance pistons and the Very Light Jet. Continuing with Cirrus' tradition of ground breaking carbon fibre technology, the result is an advanced seamless monocoque carbon fuselage that is lighter and stronger making it the state-of-the-art pressure vessel in its class. The imaginative "piggyback" engine placement and eye-catching V-tail design is a novel solution to reducing cabin noise. The Cirrus Airframe Parachute System™ (CAPS) provides the ultimate safety advantage, an exclusive Cirrus technology that has saved over 100 lives in SR20 and SR22 aircraft. The Cirrus Life is about using your personal aircraft to enhance your life, not consume it. And that is one of the revolutionary aspects of the Vision Jet. You don't have to be a full time pilot or have a flight department to take your flying lifestyle to jet speed. Everything about the Vision Jet has been designed to make the aircraft a pleasure to own and fly. Simpler to fly and easier to operate and own, the Vision Jet is truly a revolution in personal transportation. It makes jet performance accessible to pilots and aircraft owners who, up until now, could only dream. Modular seats accommodate a range of five passenger seating arrangements for maximum comfort and flexibility. Passengers enjoy automatic pressurization technologies and rear climate controls assure comfort adjustments from every seat in the aircraft. Plus, large, strategically placed windows give passengers panoramic views to enjoy. Of course, Pilot comfort is not forgotten. Easy access to the cockpit means you don't have to be a contortionist to get up front. After all, this is the Personal Jet. 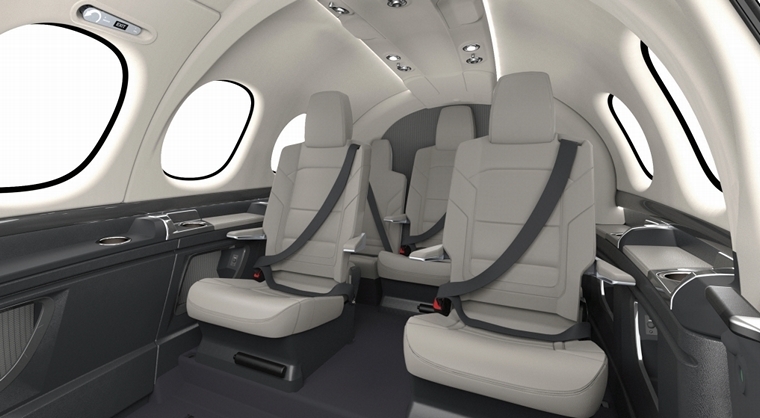 The Vision Jet is a breakthrough in personal aviation. It goes faster: 300 KTAS cruising speed. It goes farther: up to 1,200 nm. It carries more payload: up to five adults and two children. But the remarkable achievement is that you can have this level of jet performance in a true personal aircraft that doesn't require an entire flight operations department to fly and maintain it. The Cirrus Life is about using your personal aircraft to enhance your flying experience, not overwhelm it. And that is one of the revolutionary aspects of the Vision Jet. You don't have to be a full-time pilot or have a flight department to take your flying lifestyle to jet speed. Everything about the Vision Jet has been designed to make the aircraft a pleasure to own and fly. 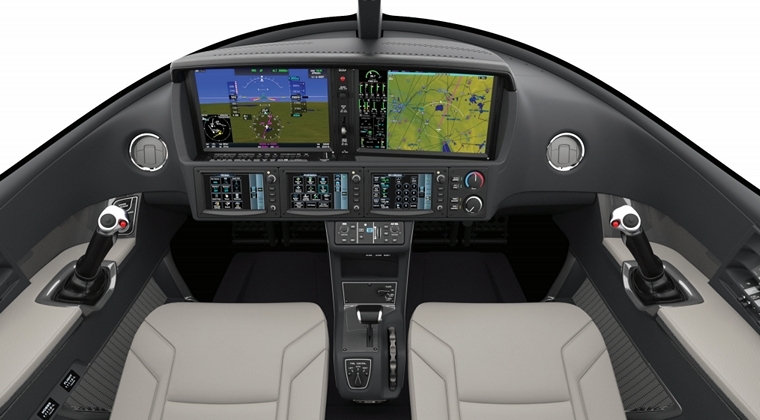 Features like side yoke controls, the Cirrus. Perspective Touch by Garmin avionics, Synthetic Vision Technology (SVT) and single lever FADEC engine control create a flying experience that lets you safely and comfortably fly with the confidence and control that can only be found in a Cirrus. Simpler to fly and easier to operate and own, the Vision Jet is truly a revolution in personal transportation. It makes jet performance accessible to pilots and aircraft owners who, up until now, could only dream. 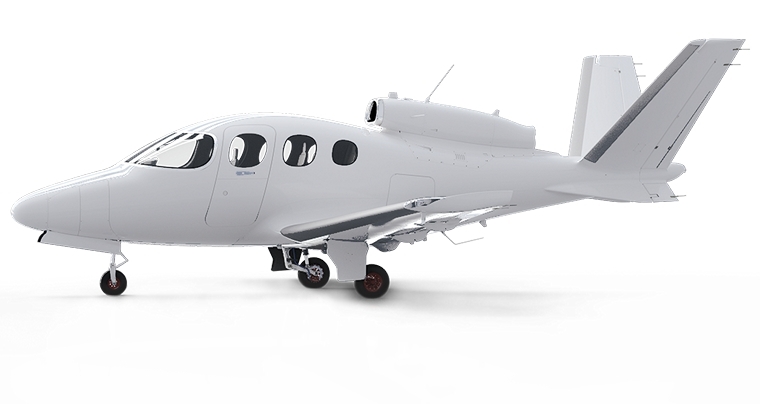 Of course, with the exclusive Cirrus Airframe Parachute System™ (CAPS™) the Vision Jet also sets a new standard in jet aircraft safety.